Mezcalero - Mezcaleria & Taqueria. Mezcalero has been the perfect addition to the booming Mezcaleria scene in Downtown Los Angeles. We reviewed them back in the day when we began Happy Hour City, nearly a year and a half ago. So, we saw it fit to comeback to our roots for our first review since our summer vacation. Business has remained steady and it is very well deserved! The staff works hard to bring a truly unique experience to patrons, Nathan McCollough is the mastermind behind the cocktail menu. If his name sounds familiar, it’s probably because we named him our Bartender of the Month back in February. What we like the most is that Mezcalero is that they are everything they advertise to be. They are a mezcaleria, taqueria, and though the cocktails are in the spotlight, they do have cervezas. We think having a focus allows for more room to perfect a menu, and Mezcalero has truly accomplished this. It’s probably why they have become so well beloved by the neighborhood. Honestly, when we sat down at the bar, it felt like a true local bar. There were a few people there together, others alone—but they were all interacting with one another. People of all ages, backgrounds, and walks of life were mingling and discussing how great the drinks and the food were. At the entrance there are two “patio” tables where you can hang with your dog if you’d like, once you enter the bar you’re technically entering through the porch, which is where we recommend you grab a table if you’ve got a large group. This area is also dog friendly but be mindful it does tend to get packed. There are regular tables as well and on the right wall, you’ll miss it if you don’t look, a bar top for those wishing to have a more intimate conversation. High top tables adorn the floor surrounded by a colorful art display on the right, exposed brick on your left, you might think there’s little room inside, but you’d be wrong. Once you pass the glass doors the bar gets really lively, (sometimes they even host Djs), there is ample seating at the bar but should you be out of luck there are high top tables to your left. Keep going and you’ll find a whole dining room in the back. The host would have guided you here upon entering but we just thought we’d let you know- there are booths. The music is always bumping something funky whether it’s cumbia, hip-hop, rap or R&B but it’s the vibes from the bartenders that truly bring it all together. Nathan has gathered a team of professionals that compliment his cocktail menu- they’re fun people having a good time at work. So, now that you know what you’re walking into let’s talk Happy Hour. Mezcalero is open Monday-Sunday, their Happy Hour is daily from 3:00 - 7:00 PM, all cocktails go from $12 to $7, draft beers go for $5, $4 glasses of wine and well drinks, and all bottles + cans of beer are only $3. We know, it’s almost too good to be true, but it gets better. On Taco Tuesdays all the tacos only cost $3 (try the octopus one!) and margaritas go for $6. Should you be interested in some brunch they do it but only on Sundays. The food menu is more than enough to grasp the talent hiding in the kitchen and at the price of $5 per plate you’re not getting regular cheap bar food. They cover everyone’s taste preferences if you’re a picky eater you’re bound to find something for you, but if you don’t… Take a look at their regular dinner menu which is also available during Happy Hour. Mezcalero. Psst! Click to enlarge. The cocktails are obviously Mezcalero’s strong suit, they’re powered with tequila and/or mezcal, fresh ingredients and gorgeous presentation. A few staples include the Smoke 'em If You Got 'em, Pepino Grande, or the Ay Papi Paloma, and the rest are subject to Nathan’s creative genius. The two rotating cocktails are the Farm To Glass and the Cocktail of the Month, which are usually the ideas of the entire team, an inspiration of whatever Nathan finds in nearby Farmers Markets, either way, both of them benefit more than just your drinking habits. Each time one is ordered a percentage of the funds go to the charity of the drink maker’s choice, how cool is that! 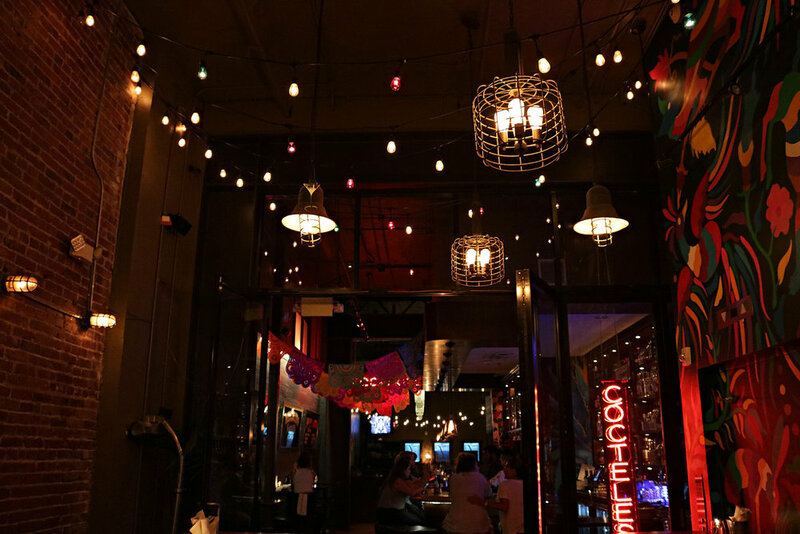 A bar that gives and gives back is always a favorite in Happy Hour City. During this visit, Mariana and Alex shared and sampled everything reviewed below. M: Okay so I immediately think of burnt french toast or someone burning breakfast. So, the name is appropriate. It’s not gorgeous, but that’s how you know they are using real ingredients. The restaurant is colorful enough, plus this is how you know they’re not using any additives which is so nice. Don’t ignore the salt on the rim, it’s the secret ingredient. To this day it’s like nothing I have ever had before. A: This cocktail is shockingly light and refreshing. It reminds me of Christmas when I was a kid, I definitely smell the cinnamon. I can see why so many people would have a different interpretation but the overall opinion is that this cocktail is really good and definitely one of the best I've had. Earthy tones are beautiful to me and it matches the culture. The color belong to the garnishes. M: I love french pastries so you know I had to order this, and I think it is my new favorite. It has the same burnt breakfast notes like Smoke ‘Em If You Got ‘Em but the hint of the Chipotle Lime gives it a citrusy difference. These ingredients are what I am all about and given that I’m a mezcal drinker, the perfect cocktail does exist. It has the right balance of flavors but none of them overpower the mezcal. A: It’s a good mezcal drink. Given how trendy it has gotten in recent times, I have seen a pattern in a lot of bars. They’ll opt for a mezcal mule or a mezcal margarita and that’s it, this is out of left field and a very good introduction to those who may not know that it’s a great spirit for cocktails- if done right. It’s not basic in anyway, I’m not too big on mezcal so this one is not my favorite cocktail but still good. M: It’s a damn good scotch cocktail, which isn’t something I can say often. It’s the different choice if you don’t want tequila or mezcal, it’s herby it’s earthy but it’s sweet like honey. Highly recommend. A: Delicious scotch cocktail. Pretty simple but, once again, the added fresh ingredients gives it great flavoring, the fresh ginger is not overpowering just the right amount. It’s my favorite. M: Well, the name certainly draws a giggle. It is certainly pink, compared the color of the other cocktails, it’s probably the only one on the list that’s this bright. Personally, it tastes a lot like watermelon juice, I can’t taste the cabbage. It’s definitely one of those drinks that doesnt seem to have liquor but in my book that qualifies as dangerous. Yet I’m asking myself, can i get drunk from this? A: It’s not my cup of tea, the flavors match the menu, but in my case the cabbage overpowers the watermelon. However, I do hate cabbage. M: It’s amazing! It’s not spicy its not too sweet but it isn’t simple. It has complexity, damn near has a personality. The garnishes’ scents compliment it so very well. A: It’s very good, to me the flavors are like eggnog meets the tropics. All the right spices are present. All around a great rum cocktail. A: It’s absolutely delicious. Damn well made, you can tell ingredients are fresh. Let’s be honest, the only way to drink a Daiquiri is with fresh ingredients. Nailed it. M: Personally, I enjoy the fact that it’s not as strong as other Daiquiris I have tried. I tend to shy away from those because they’re so potent, this was a nice surprise. More on the rum side than the lime but it’s well balanced. It’s a simple cocktail, bonus points because of the fresh lime which is my favorite flavor ever. A: These fries are delicious. They have a pleasant spice to it. The chipotle mayo adds a kick if you need it. They’re crispy, the lime flavored is strong but good. M: These fries are my second favorite thing here, the lime and the cilantro make them perfect. Pro tip: Skip chipotle and dip them in the guacamole. M: Never really had elote too often, but this is spicy for me. However it’s just a level below too spicy i prob couldn't eat both. But it’s good, i do love corn so that’s why i came through. Id like to add more cheese to em to douse the spiciness of the takis. A: Good. encrusted in takis. Adds the crunch. Not for those who hate heat. A: Wow this is delicious. Everything used is high quality. The watermelon is juicy and fresh, with the tuna they make a great combo. The carrots add texture while the miso sauce adds an earthy flavor. It’s very well made! I’d recommend this those who might want something light and refreshing and that won't weigh you down while sipping on cocktails. M: Most revolutionary bar snack I have ever had. Nothing like the tiny cheap tostadas they sell at taco trucks- the size is generous. The summer feels are there with the watermelon. It’s all the right flavors for me given the sprinkle of cilantro, the carrots add the chew, it’s not soggy or impossible to pick up. The miso drizzle around the plate is heavenly- don’t sleep on it. A: These have a very nice crispy outside, with the juicy tender inside, flavor is great. Nice spice without being spicy. Flavorful, not overpowering lemon, nor underwhelmed, they’re perfectly seasoned. M: Huge fan of not spicy wings and lemon pepper, plus the dry rub is a win. No mess! You get 6 for $5 total steal. A: Eh, these aren’t bad but they’re nothing great. They taste good but it’s a little underwhelming considering everything else we have tried here. They have a nice crisp, not too ender, and a bit hard to chew. Not horrible but not my favorite. M: Yuca has never been my thing despite my Latina roots. Still, they taste good, the chipotle mayo certainly makes the toughness easier to bite down on. Mezcalero will hold a special place in anyone who visits’s heart because of the unforgettable experience granted by the staff and menu. They truly feel like a place where you can go to unload, have a date, start or end your night, or even just to sit at the bar by yourself. Their Happy Hour caters to the growing community around them and a year in, they’re packed almost every night. We highly recommend you all to come grab a seat at the bar and get to know the minds behind it, you won’t regret it. We’d like to thank Nathan and his team for catering to us during our visit, it was a pleasure as always.